“Opera” is a fictional account of a young, ruthlessly ambitious mezzo-soprano, Natalija, who uses any way she can to get ahead in the fiercely competitive international arena of her chosen world. She sacrifices everything for her art. Unable to turn down leading roles, she works herself to death and blocks any feelings she has with her eating disorder. The characters and opera company itself are purely fictional but are inspired by real-life accounts from performers across the European stages. Her story highlights the enormous pressure to be beautiful and slim and the constant drive for perfection. Although based in Hungary and Italy, Natalija’s story could take place in any large theatre company in Europe. She is Hungarian but her passion is Italian; forever volcanic and explosive. 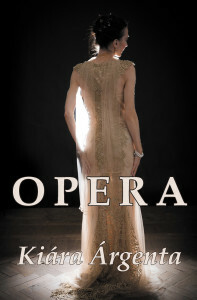 The bitter rivalry which takes place within the opera company is centred around her; she is the catalyst for the fighting amongst the other singers. She is also the narrator of this novel and we see the world through her eyes, which begins to get darker as events gather pace relentlessly with seasons melting into one. Natalija is definitely not a character you should immediately warm to, indeed she opens the novel by announcing that “You should hate me and I would be disappointed if you didn’t”. She is mercilessly cruel to her lovers and rivals alike, hurting anyone who tries to get close to her. However, by the finale the reader should have some sympathy for this damaged girl as she is shaped by past events in her life, her health ruined by her eating disorder and repeated bouts of tonsillitis. As she believes there should be no happy ending in the opera world, it stands to reason that Natalija will not have this either.